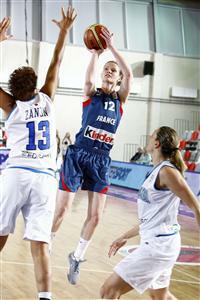 France recovered from a shaky first period in their EuroBasket Women 2009 opening match to beat Italy (76-61). Sandrine Gruda had a good match for France as she led all scoring with 23 points. She also recorded 7 rebounds and 1 block in her 22 minutes on the court. France got off to an aggressive start and scored their first points of the game through Emilie Gomis with just under 50 seconds on the game clock. Both sides were active offensively during the first couple of minutes. Raffaella Masciadri (left)and Laura Macchi scored for Italy while Céline Dumerc connected with a three-pointer for France as they led (5-4). Sandrine Gruda increased the advantage for France with a shot close to the basket. However seconds later she had to leave the court after picking up her second personal foul with less than three minutes played. Pierre Vincent was forced to make his first tactical change by bringing Isabelle Yacoubou-Dehoui into the game. France slightly lost their composure in defense by committing too many fouls. Italy took advantage with free trips to the free-throw line to go in front for the first time in the match (9-7). Pierre Vincent decided to turn his bench and was rewarded as France regained the advantage through Emmanuelle Hermouet. Anaël Lardy extended the advantage of France to 3 points (13-10) before poor defending and unnecessary fouls allowed Italy more free trips to the free-throw line. Italy hit 8-from-10 from the free-throw line and scored a total of 14 points and were called for only 3 fouls. France on the other hand did not make it to the free-throw line in the first 10 minutes and committed 8 fouls but won the first quarter as Florence Lepron (right) hit a period-ending buzzer beater 2-point shot (15-14). Giampiero Ticchi, the Italian head coach, decided to change things around at the start of the second period with emphasis on long range shooting. Masciadri fired one shot from behind the arc to open the scoring in the second quarter. Although Nwal-Endéné Miyem brought France back on level terms, three-pointers by Francesca Modica and Macchi put Italy in control (25-21). France were then on the back foot and started to turn the ball over. They missed many opportunities from the free-throw line (3-of-7) as they clawed themselves back to draw level (27-27). Macci was left open and nailed her second trey of the quarter to put Italy back in the lead. Gomis hit back for France with a couple of free-throws. Sandrine Gruda who was all over the court for France scored her 8th point of the match as her side went ahead briefly. Marte Alexander forced her way to the basket to score and also forced Lepron into committing a foul. This enabled her to add 1 more point to her tally from the charity stripes. Yet France were able to go into the interval ahead 1 point (34-33) thanks to a couple of free-throws from Ndongue. The cat and mouse tactics from both coaches continued in the third period. Italy were first off the mark with Masciadri and another trey by Macchi (38-34). Gruda hit back to back baskets for the teams to draw level again. Then both sides exchanged baskets continuously until (42-42). Gruda (left) continued her one-lady show with 3 more points that started a 7-point run. This enabled France to open the first significant lead of the match (49-42). Italy’s only points during the last three minutes came from the free-throw line while France stretched their advantage as they went into the final period with a 13-point lead (57-4) with Lepron and Melain scoring from the free-throw line while Yacoubou-Dehoui and Hermouet (3 points) scoring from the field. France controlled the pace of the game in the final period and with Gruda in fine form added a couple of points to their advantage leading (65-50) with 34 minutes played. With the game over as a contest, Pierre Vincent decided to turn his bench once more as France went on to win (76-61). Gruda led the way with 23 points and 7 rebound while Hermouet was the only other player in double digits with 10 points. Fort Italy Macchi finished with 16 points while Simona Ballardini scored 10 points.